How to Edit YouTube video? YouTube is the popular video sharing site that you can use to stream videos related to anything. Videos that are uploaded on YouTube may have various corrections. If any particular scene is bothering you then you can take it out. Are you looking for ways to edit your YouTube videos? Then here is the quick and easy guide to follow. This task can be done using the YouTube editor. This editor is simple as compared to other editing programs like Movie Maker and iMovie. How to use YouTube Editor? Access the YouTube editor by visiting YouTube.com/editor. There you can use Linear video editors. These are made with intuitive and easy-to-use timeline. For adding any clip into the project, you can drag the clip onto the timeline. In order to edit your YouTube video, you need to trim it from the beginning or end. But, YouTube doesn’t allow you to cut the video in between. For removing anything from the middle of the video, you need to drag it twice on the timeline. In this way, you can have two different clips from the same original source. This trimming process is not very simple. Video constantly reloads on the display when you are adjusting the slider for trimming. The best way to trim the video is to decide the start point and endpoint in advance. YouTube editor also provides a tool for stabilizing the shakiness. When you take the mouse over the video, it will show three icons. Choose the center one and you can find that particular clip on a new window having several editing options. Also, YouTube lets you join the multiple video clips. For this, drag the video clips on the timeline and arrange them as per your wish. Also, it provides segue options. Additionally, it offers the facility to add your own music. For this purpose, click the tab marked with a music note and you can see a list of songs. You can choose these songs for your video. 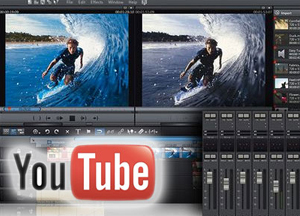 Therefore, by using the above given tips you can edit YouTube video easily.